In Spain in 1991, Arias created a new family of fresh cheeses, or modern “quesos frescos”. Produced using an innovative process based on ultrafiltration technology, they had the advantage of a longer life than traditional quesos frescos. This proved to be the start of a great success story. Burgo de Arias now offers a range of specialty fresh cheeses that can be enjoyed anytime. Delicious and light, Burgo de Arias can be eaten on its own, in salads or even as a dessert. The brand is leader in its category in Spain. 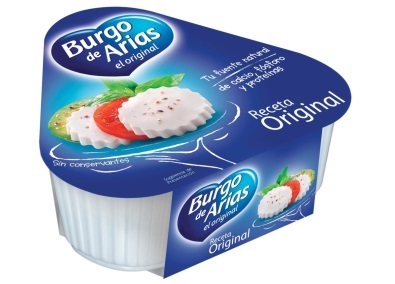 Burgo de Arias is also available in 0% fat, salt-free or calcium-enriched versions, especially suitable for the elderly. Since September 2016, the Burgo de Arias brand has offered a cheese with its lactose content reduced to only 0.03% specifically formulated to improve the digestion of those suffering from lactose intolerance. After the success of the Burgo “mousse”, the brand diversifies and launches new cheese balls, a range of delicious fresh and slight cheese specialties that can be consumed at any time of the day. The brand thus brings freshness and delicacy to the tapas time in Spain by combining the unique and slightly salty taste of cheese with the gourmet flavors of Tomato and Figs.